After eating these sweet and herby berries, you’d never think they were related to tobacco. Thankfully, they’re much healthier than their cousin. 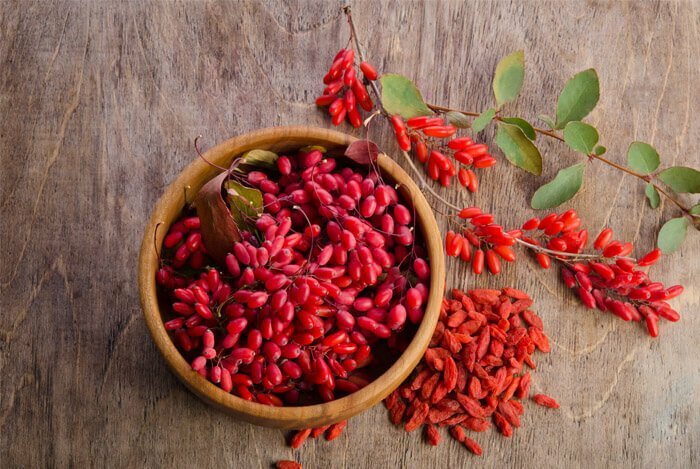 Goji berries have only burst onto the health food scene in recent years but their unique flavor and potential benefits have long been recognized in other cultures. In fact, goji berries have a rich healing history, having been used in ancient forms of medicine for over two millennia. They are believed to be especially potent in the treatment of liver and kidney problems, and have also been used for blood health, maintaining eye sight, as a sleep aid, and in the quest for a lengthier lifespan. Gojis go by other names too – they’re also known as lycii fructus, lycium barbarum, wolfberries and even ‘red diamonds’, showing just how prized these fruits really are throughout Asia. 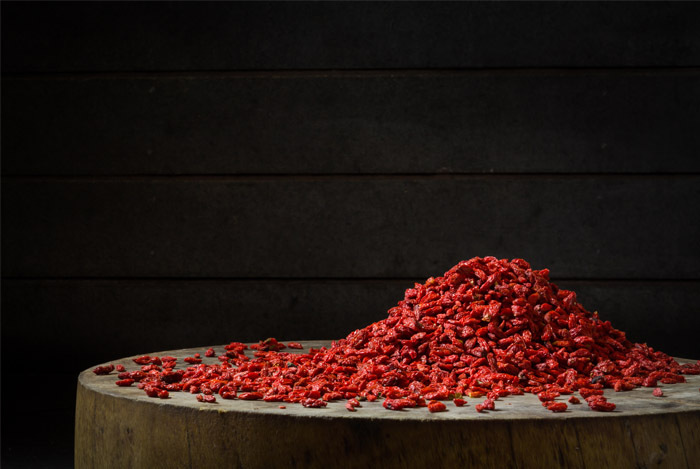 Let’s take a closer look at goji berries and all they have to offer. 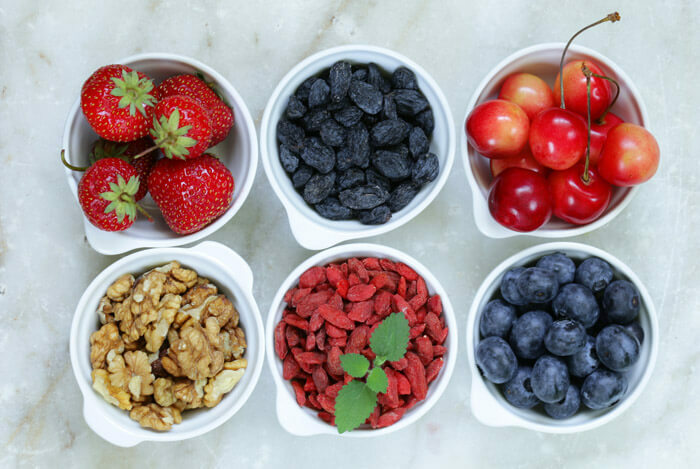 Antioxidants are important in the fight against cancer, and goji berries are loaded with antioxidants. Gojis also contain an anti-inflammatory agent called beta-sitosterol. This means these humble berries could play a role in helping to reduce your chances of cancer, arthritis, allergies, and premature aging. So, if you’re following the anti-inflammatory diet, or suffer any inflammatory condition, you’ll be happy to hear you’re doing your body a favor by snacking on these delicious berries. 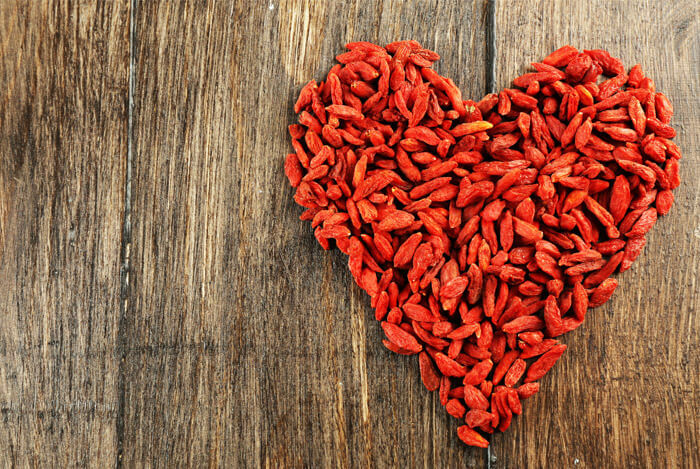 Goji berries pack some serious nutritional punch for their size. One 28 gram serving has 3 grams of protein. Okay, it’s not going to rival a fillet steak anytime soon, but that’s an impressive protein load for a fruit. Even blueberries, one of the most nutrient dense berries out there, contain almost no protein in the same size serving. Goji berries also contain 18 different amino acids, including all of the essential ones, which help repair body tissue and muscles. Thanks to their tiny seeds, this fruit is a very good source of fiber, and contains vitamin A, vitamin C, riboflavin, iron, potassium, zinc, copper, selenium, thiamin, and calcium. In fact, 100 g of these berries can contain over 100% of your recommended daily value of vitamin C (depending on their quality) and, ounce for ounce, they have more iron than spinach. I have to say, I wasn’t expecting such big stats for such little fruits. Because of their high levels of vitamin C and other antioxidants, goji berries may help boost the immune system. 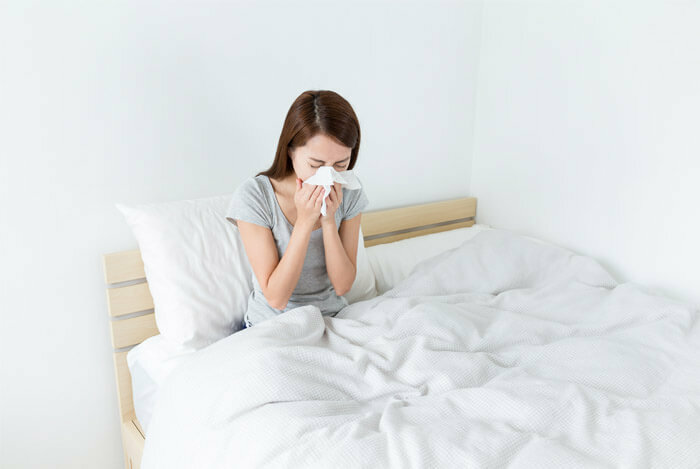 Not only does a high level of immunity ward off colds and flu, but it keeps more serious illnesses like cancer at bay. Get ahead of cold and flu season this year by starting to add gojis to your salads and smoothies. Goji berries may help protect against neurodegenerative disorders like Alzheimer’s disease. This may be because of the high levels of antioxidants in the berries, which prevent oxidative stress in the brain. And, inflammation is linked to Alzheimer’s, so it’s possible that the anti-inflammatory powers of these berries will offset symptoms. 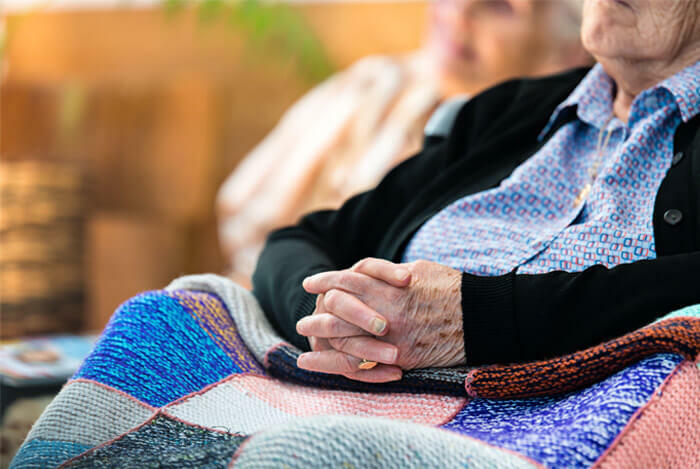 A study on the effect of goji extract has shown promising neuro-protective effects, which researchers hope will have therapeutic potential in the prevention of Alzheimer’s disease. If nothing else, you’ll be getting some fiber and antioxidants. Age-related macular degeneration (AMD) is the leading cause of blindness in the US, affecting as many as 11 million people. That number is expected to double to nearly 22 million by 2050! These mighty berries contain high concentrations of the compounds lutein and zeaxanthin – known for their abilities to protect the eyes from oxidative damage, along with reducing the risk of AMD. Even those already suffering from AMD should try some gojis – a major study has shown that consuming lutein and zeaxanthin can slow the progression of macular degeneration once it has started. What’s more, the antioxidants in goji berry may even be a natural way to prevent glaucoma by protecting the cells in the retina. 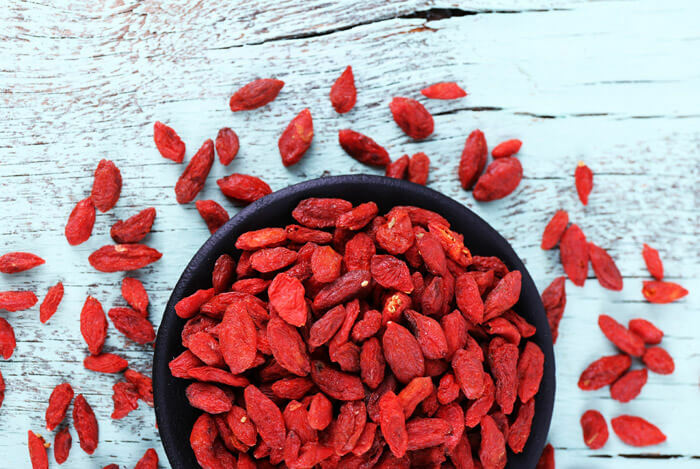 Now that you’re sold on the benefits of goji berries, you’re probably wondering where to find them, and what to add them to. It’s getting increasingly easy to come by goji berries – try an Asian food store or health food store. I’ve even found them in the supermarket right near the nuts and other dried fruits. A goji berry, kale & quinoa salad…it’s a serious superfood lunch! Goji berries may interact with some drugs like the blood thinner warfarin. They may also interact with medication for diabetes and blood pressure drugs. Check with your doctor before taking gojis if you’re on any medication or suffer allergies but other than that, it’s probably safe to enjoy gojis in moderation. I’m a big fan of goji berries – mainly for their sweet taste and chewy texture. Even though they’ve been around for millennia, goji berries are still pretty new on the US health food scene. Studies on their health claims aren’t all that common, but I hope that changes as their popularity grows. For now, the research I came across on this ancient superfood has shown me that they have a lot more going for them than just their flavor, and I’ll definitely continue to enjoy them as part of a balanced diet. What’s your take on goji berries? Have anything else you’d like to share? Let me know in the comments below!